I love white subway tile. Like, 15 years forever. So, in other words, a really long time. 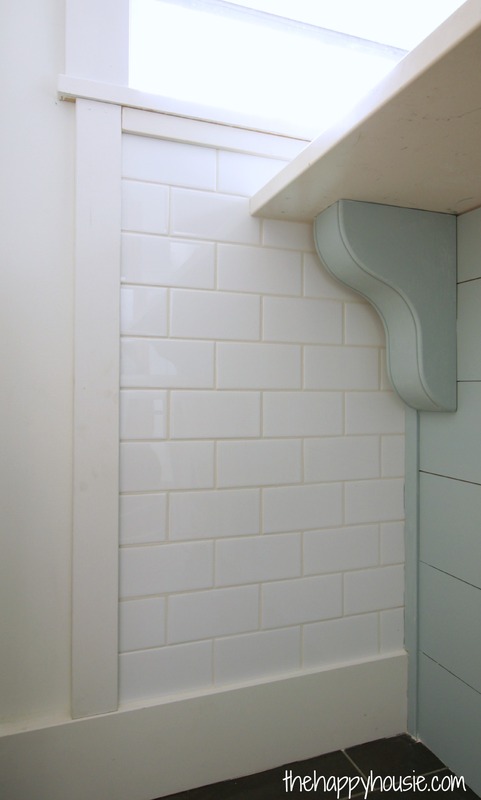 We DIY installed it in our very first little house renovation as the tile in our shower. But, sadly, I have never had the chance to use it again in any of our future houses. 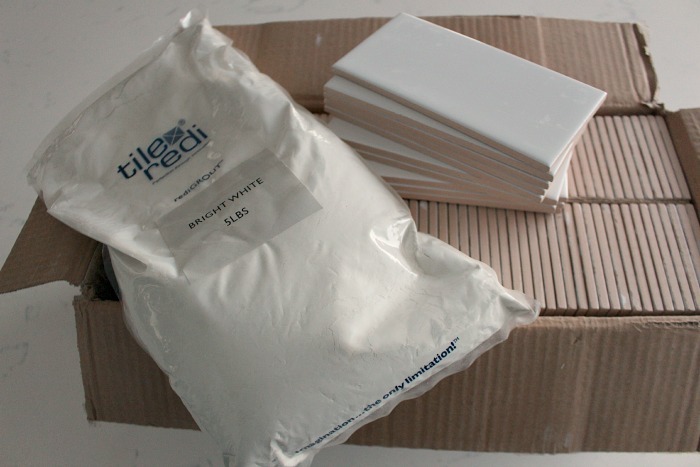 When planning our kitchen renovation I knew that I wanted to use white subway tile and selected and ordered this 3×6 Daltile from build.com as well as white unsanded Tile-Redi Grout to go with it. I love the 3×6 size. I used the 4×8 size during our previous bathroom renovation but like the slightly smaller scale for the kitchen backsplash application. We decided not to DIY this project because of the massive scale of it – I wanted to be sure that it was absolutely PERFECT since it spans the entire back wall from counter to ceiling… and wraps all the way along under the windows, and down to the baseboard beside the peninsula. So we called a friend who is an absolute PRO tiler and had him take over, gathering some amazing tips along the way to share with all of you! Plan out your design before you start – measure and sketch it out on paper to prevent any mistakes. Plan to start in the middle of the wall and work outwards. 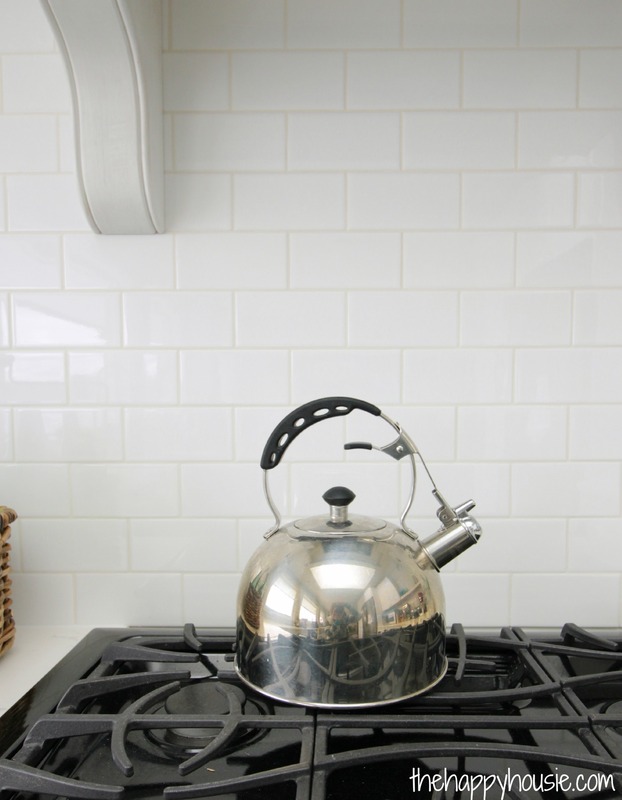 By starting in the middle you ensure that you won’t end up with little itty bitty bits of tile on one corner and larger tiles on the other corner, which would give your backsplash a lopsided and unprofessional finish. Also, if you are planning to install shelving after-the-fact, then figure out where your studs are ahead of time and record this information somewhere so you know where the studs are after the tile has been installed. If you have a pre-existing backsplash, then remove it as carefully as possible, trying to minimize damage to the drywall. Then repair the drywall and give it a quick coat of primer as the ideal surface for adhering your tile to. Also, if you plan to install any shelving or anything else in the kitchen, try to do so AFTER you have installed your tile in order to prevent having to use little bitty pieces of tile that are difficult to cut and work with and leave a messy looking edge. 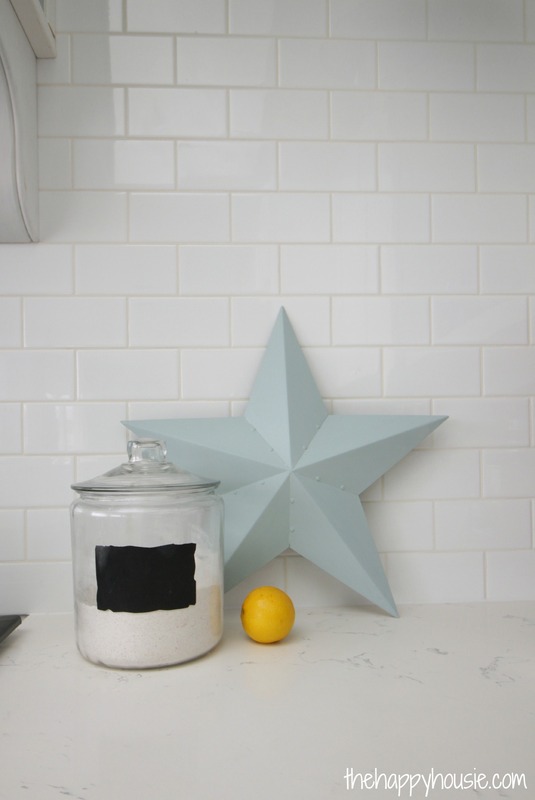 Cut whole tiles in half for the staggered design of a classic white subway tile installation. By cutting them in half ahead of time, you make sure that you get two exact 1/2 tiles with one cut which helps you keep your tiling lined up precisely as you work your way across the wall. You want to use as many full and half tiles as possible and avoid little bits of tile for the most clean and professional look. Read the package instructions clearly so you get an idea of the setting time- and mix your grout in small batches. You don’t want it to start to go hard before you have time to apply it. The texture of your mixed grout should be not too runny and not dry and crumbly- sort of like the consistency of cheez whiz or peanut butter. Just don’t dress your celery with it. If you are using white or very light grout in a high traffic area or more active area of the kitchen, you may want to seal the grout in order to prevent it from staining and marking over time. Nothing looks grosser then dirty, stained grout; especially when you can see that it is crisp, clean, and white in other areas of the backsplash. Finish off your tiling with caulk- and to keep your caulk line nice and clean and crisp, put painters tape along the edges of the backsplash. This also helps prevent caulk getting on your freshly grouted and sealed tiles. Didn’t it turn out absolutely stunning?!! I can’t wait to show you the full picture- but there are a few jobs to wrap up before the big reveal. I will be back next week with some more details on that planked peninsula you get a glimpse of in the photo just above. We do have some tile left over so I am hoping to share a DIY Tile video of my own soon, when we install the rest of our white subway tile in the kitchen of our rental property. Stay tuned!! Until then, if you are looking to install some ceramic tile yourself, check out this easy to follow and concise video by build.com on their YouTube channel. They have some great tips to help you get started, and although it shows how to tile a floor, but many of the same principals apply to installing a backsplash. I really appreciate your advice to plan ahead. My wife and I really want to get tiles on our floor. Is there advice that you would have for floor tiles? Your kitchen was done in 2015. How does it look now. I’m considering an all white kitchen but I worry about white subway tile with white grout. How has your clean up been? It’s been perfect! We don’t really get a lot of mess splashed on our tiles and when we do we wipe it up. 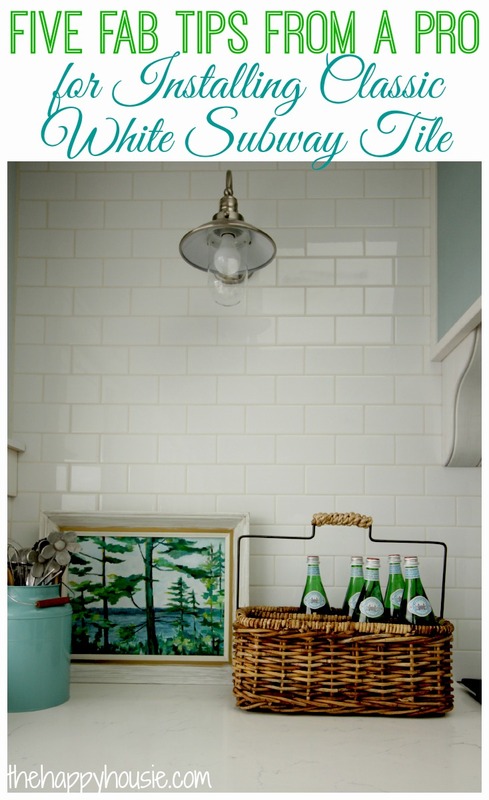 The creamy white grout still looks perfect. Hi great project!! What spacer size you used? 1/16″ or 1/8″? Thanks Kelsey! There are so many different ways you can go with it- but I am glad that we went pretty basic in our application. I love the clean, crisp look of it! 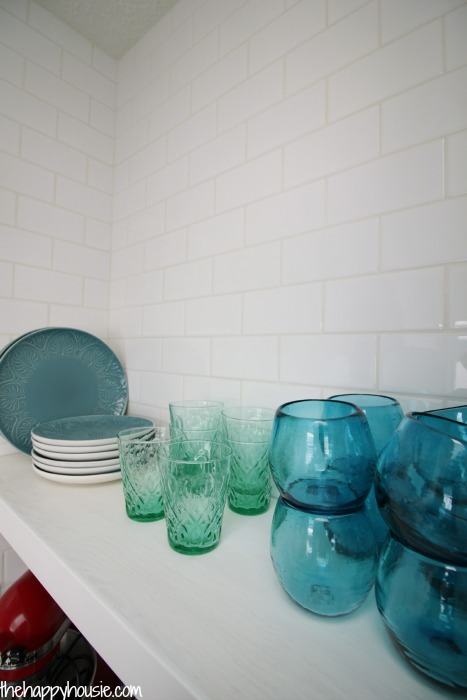 I love the white subway tile-it’s so clean looking and classy. Well done!! Thank you McKenzie- it really made a huge difference to finishing off the kitchen. We are just about ready for the reveal. Just about. I LOVE how your tiles turned out! Perfect! We are getting ready to tile our back splash and I’m debating between a subway pattern or herringbone. I keep flip flopping. We are also adding something to our peninsula. I was thinking bead board. I didn’t consider planking it, though, that’s a great idea. I can’t wait to see your reveal! What is the counter top? I also debated between classic subway pattern and herringbone. I love the herringbone. I also considered doing an inset of herringbone just above the range. I decided to go classic just because I wanted the look to last and feel current as long as possible. Hard decision, though!! I love the planking- we’ve done so much bead board in the past so I was happy to try a different look. Plus, that is easier to change down the road then tile, I figure. The counter top is white quartz- it has a marble look to it. Good luck with your project!! Kitchens are so satisfying but there are so many important (and potentially expensive) decisions!! Oh my gosh, that is so funny! I am debating the same things now, including the possibility of doing the herringbone inset over the range, haha! We have counter tops coming in next week – Quartz that looks like marble, 🙂 We are doing a honed marble 3×6 tile on the back splash. I can’t wait to see your reveal!! Oh I bet that honed marble 3×6 is going to be absolutely stunning!! I thought about going with something a little more luxe (aka more expensive:) but we had such a big area to cover…and I do love the classic look of white subway tile. 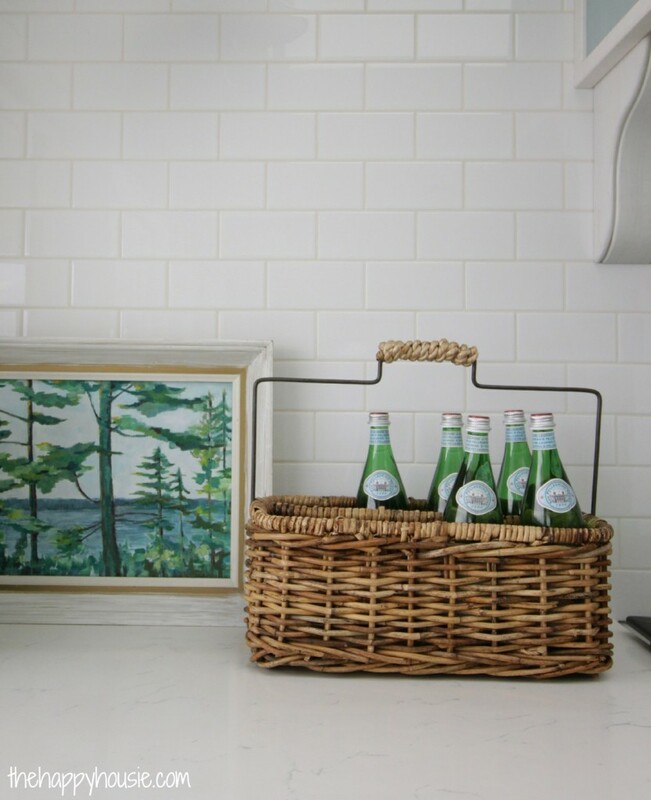 But after I saw images of how stunning the marble subway tiles turned out in my friends kitchen, I was definitely kicking myself for not choosing a marble tile! I love white subway tile!! So classic and fresh. We are putting the larger 4″ x 16″ in our shower (less grout lines to clean hopefully) and I am so excited to see it done. I also love that sneak peek of your peninsula!! Where did you get those corbels?? Hi Sherry! That is a great idea- doing the subway style pattern in a larger tile. I agree about the grout lines in the shower. I can’t wait to share more about the corbels with you next week! They are gorgeous- we ordered ours through Osborne Wood Products. LOVE them! !